Yesterday’s Day Poem was about waking to a heavy frost. What I did not say is that I got dressed and went out into the yard to capture the event in photos, just as the sun was rising. 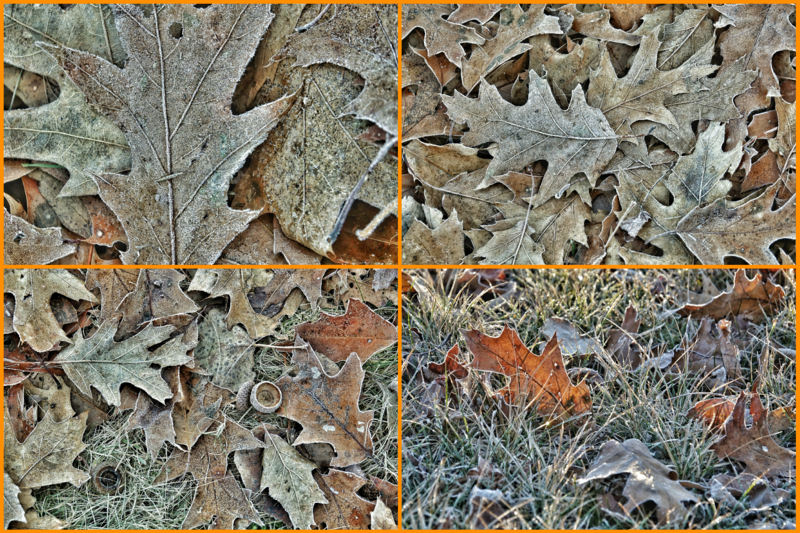 These four images catch some of the feeling of the frost on the oak leaves and grass. Sony RX10iii in-camera HDR. Processed in Snapseed to bring out the frost effect, and assembled in PicStich on my Android tablet. white, and the cars looked covered. it is always, at best, a mixed blessing. be admired, after all, in a heavy frost. 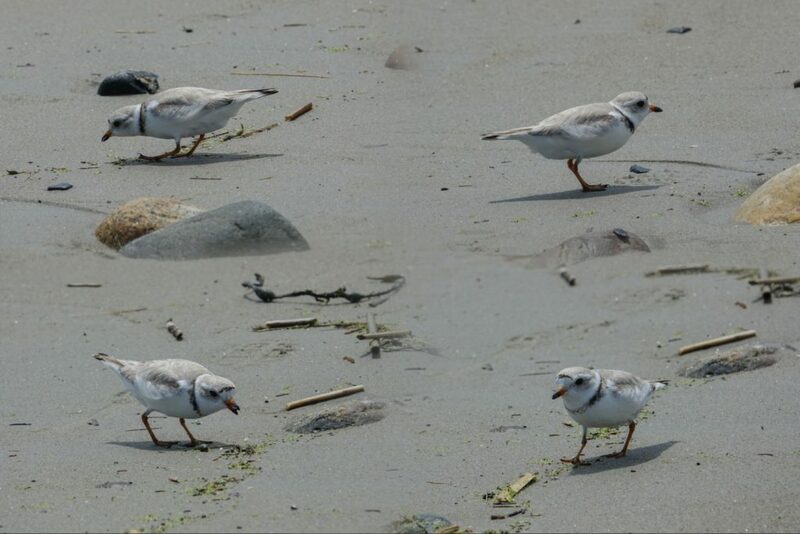 Piping Plover, Laudholm Beach, Wells Maine. 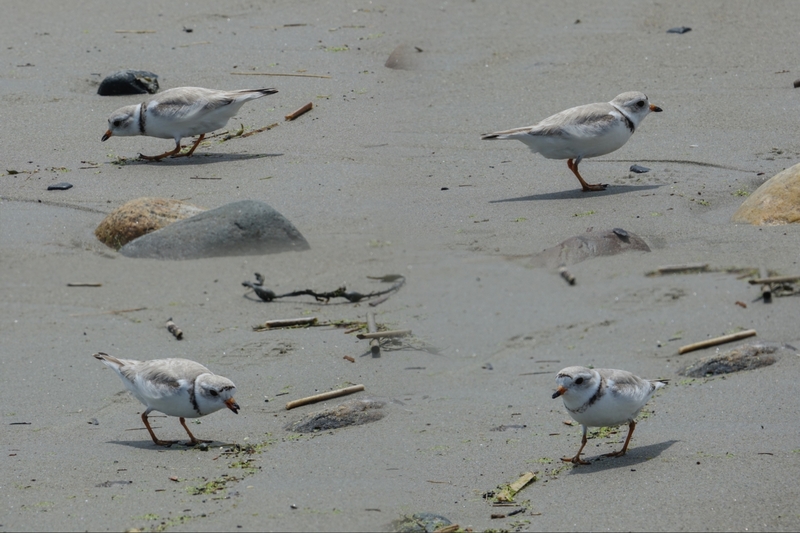 Piping Plovers are endangered in Maine, largely because the beaches they prefer for nesting are also the beaches both Mainers and tourists prefer for sunbathing, jogging, walking dogs, and general recreating. Add in the population of cats that inhabit beach houses all along the coast, and the native foxes, raccoons, snakes, and gulls…all of whom prey of the eggs and chicks of the Piping Plover, and, if the nest does not get stepped on by a tourist, it is likely to be raided before the chicks hatch or fledge. The State of Maine and the Federal Government have set aside “Protected Areas” for the last nesting colonies of Piping Plovers on our beaches, but dogs, cats, and natural predators can’t read the signs or “see” the stakes and orange ropes that are supposed to keep the areas safe. Neither can, apparently, some tourists. It especially irritates me to see people running their dogs on beaches with nesting colonies, contrary to the clear posted signs. 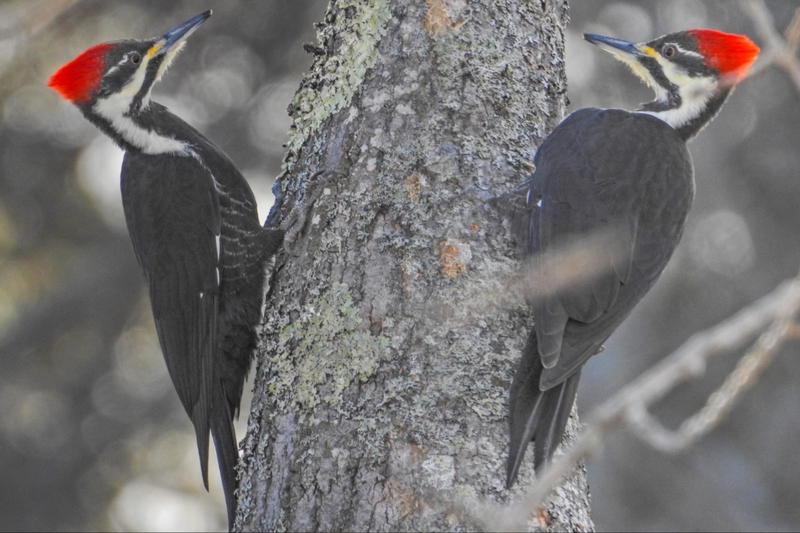 Maine Audubon has a volunteer/paid program that puts people on the beaches to monitor the nesting areas and keep as many predators (human, canine, feline, and other) away from the birds…but they are only there during daylight hours. And of course, the Piping Plovers themselves pay no attention to the protected areas either. They might or might not nest behind the barrier, but they certainly do not feed there. This Plover was way down the beach from the posted signs, running along the little line of green stuff deposited by the receding tide. Back up at the nest area, the State has erected a wire mesh enclosure around a cluster of nests, but while out feeding, the Plovers are on their own. The number of chicks fledged each year in Maine is counted in low double digits, and that is on a good year. 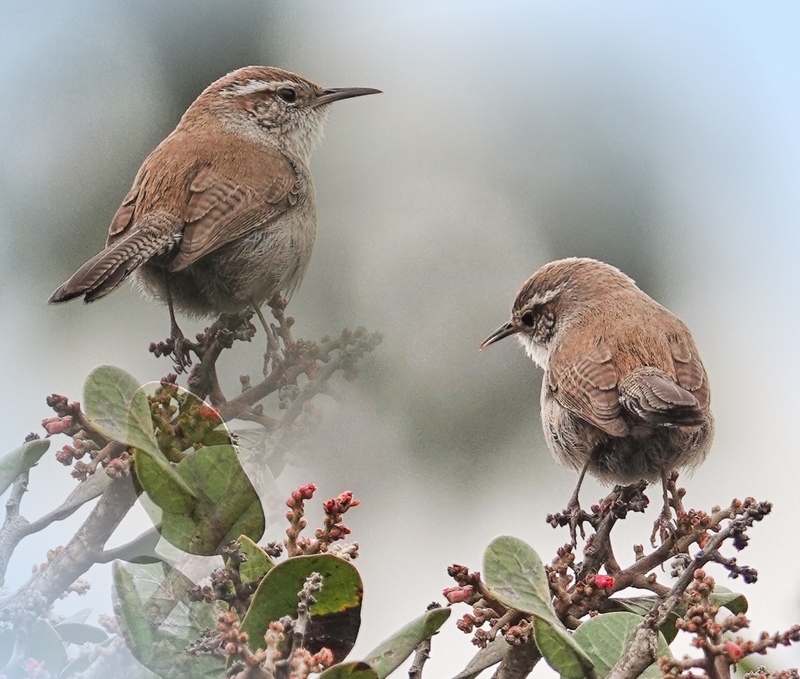 And they are such cute little birds. Full of attitude! 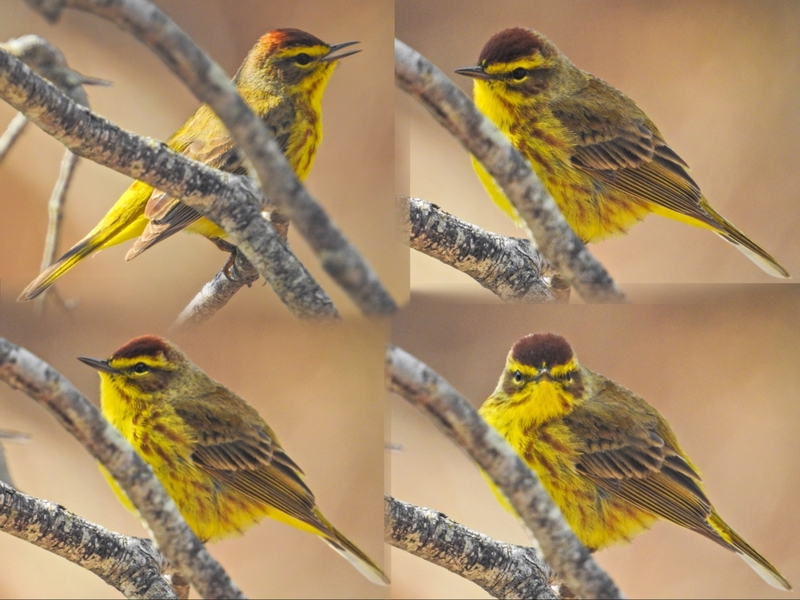 This is a panel of 4 shots of the same bird (one of only two I saw that day on the beach). Sony RX10iii at 840mm equivalent. 1/1000th @ ISO 100 @ f5.6. Processed in Lightroom and assembled in Coolage. Blackburnian Warbler, Magee Marsh, Ohio. Nikon P900 at 1600mm equivalent field of view. 1/500th @ ISO 280 @ f6.3. Processed in Lightroom and assembled in Coolage. Nikon P900 at 2000mm equivalent field of view. 1/500th @ ISO 320 @ f6.5. Processed in Lightroom and assembled in Coolage. On the first day of 2016 I went to look for the Kennebunk eagles at Roger’s Pond. No show. But while I was there I saw a largish bird fly low and into a dead tree just where the creek joins the river, at the turn of the loop around the pond. A while later I heard a knock. Knock! Pileated Woodpecker! This is only my third photo op in Maine, and I have not seen them much more often than that either. They are around…even around my house…and I hear them occasionally, but a good sighting is rare. 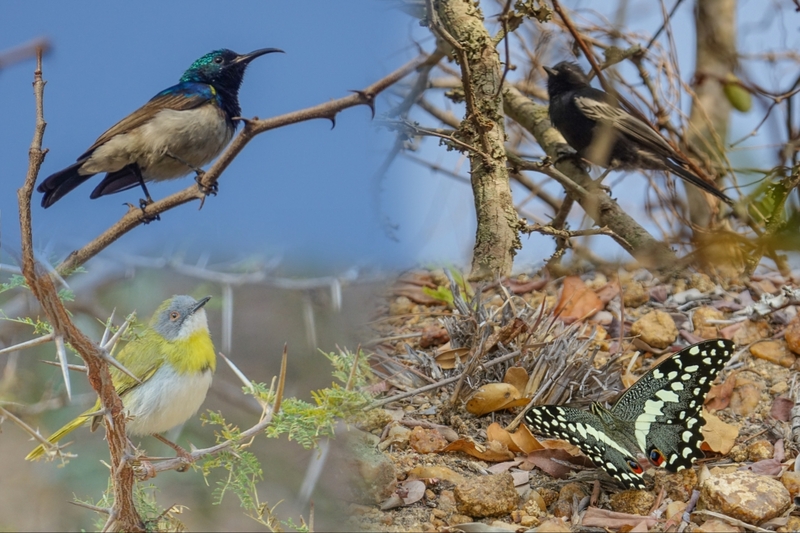 Rare enough to make this an auspicious first bird for 2016! This image is not what you might think at first glance. I used Coolage to assemble two images of the same bird, at different points as it circled the trunk, into a single image. Since Coolage blends edges and the trunk is an ideal object for a blend, it certainly looks like two Pileateds. It is not, trust me. I just wanted to give you two views of the bird. 🙂 And it does make a striking image. Or that is what I think. Nikon P900 at 2000mm equivalent field of view. 1/250th @ ISO 400 @ f6.5. Processed in Lightroom and assembled in Coolage. 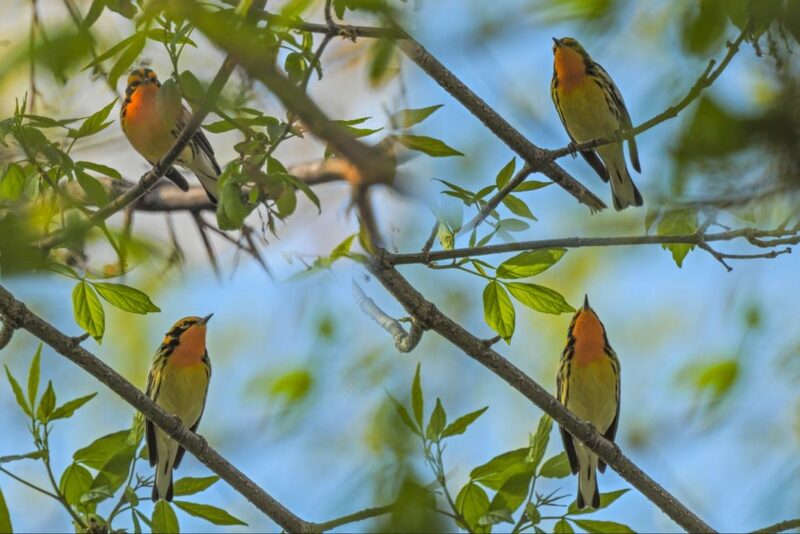 Sometimes it is nice to have multiple views of a bird. 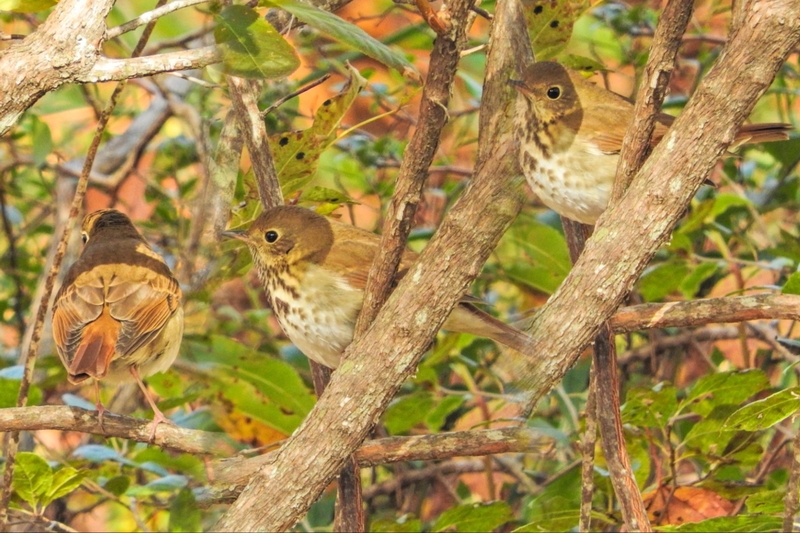 This Hermit Thrush, which we walked up on along the Maple Swamp boardwalk at Laudholm Farm (Wells National Estuarine Research Center), was fairly busy in the bush, and gave us front, back, and center views over the few seconds it took to take a series of photos. Then it was away, across the boardwalk and into deeper brush under the trees. 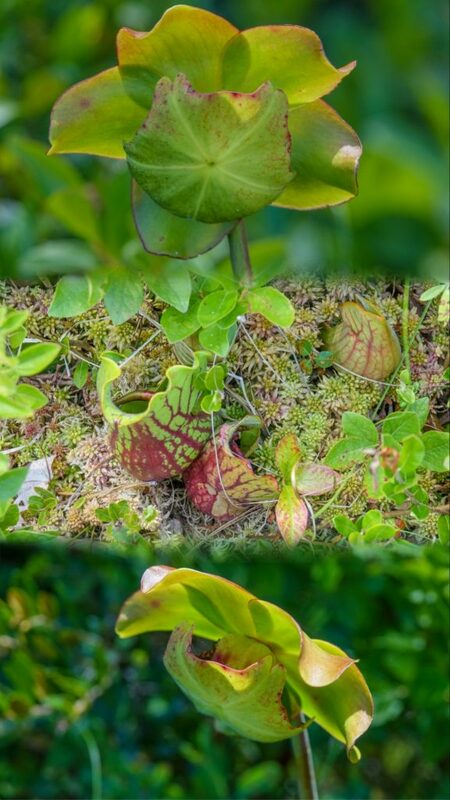 This collage shows off all the recognition triggers for the species. The general Robin-like fat oval thrush shape and distinctive beak shape, the speckled upper breast, and the “tells” for this species…the rusty tail and wing tips and the fairly bold eye-ring. The mid-afternoon October light was great. Nikon P610 at 1440mm equivalent field of view. 1/160th @ ISO 400 @ f6.5. Processed in Lightroom and assembled in Coolage. I believe this amazing creature, only a little over a half inch long, might be a Blue-green Cricket Hunter Wasp. 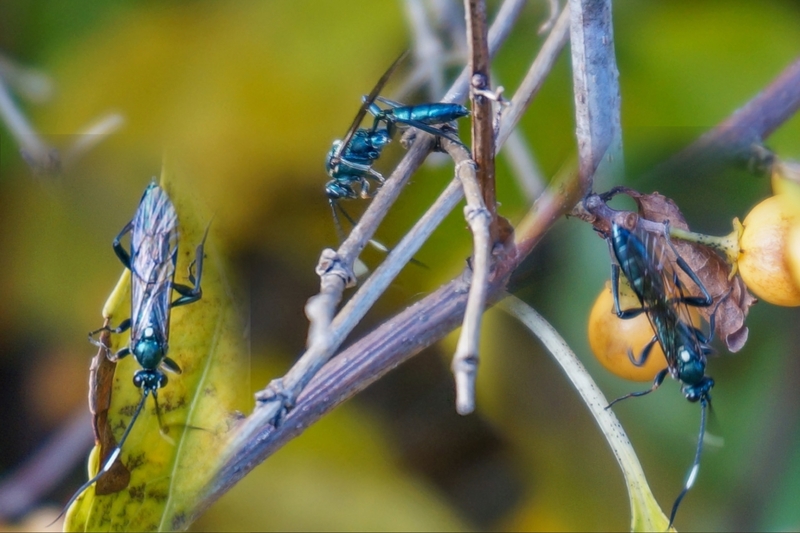 It could also be a Blue-green Mud Wasp. I have not been able to find any images via a Google search that have the white spot between the wings or the white section in the particularly long antenna. If it is not one of the species mentioned above, it is certainly a close relative. I found it while photographing Bittersweet at the Wells National Estuarine Research Center at Laudholm Farms a few days ago. This is a collage of three shots. Sony Alpha NEX 5T with 16-50mm zoom @ 140mm equivalent field of view (2x Clear Image Zoom). Processed in Lightroom and assembled in Coolage.